Tristan Wells (AKA Punter) of Canberra is one of the leading lights of the Australian Vaccination-skeptics Network. He has been the darling of past-presidents Meryl Dorey and Greg Beattie for as long as I’ve known of the anti-vaccination cabal. You know that you can bully us with relative impunity and you like to bully people – so that is what you do. If you could bully other groups of people who questioned your cherished beliefs with the same impunity you would happily bully them too. I’m no hero Tristan Wells – though I thank you so much for saying so 🙂 I believe with every fiber of my being, that natural justice will one day see these people held accountable for their actions. Nobody *catches* anything. Disease cannot be spread from person to person – if it could doctors would have the lifespan of a fruitfly. So, there have been several indications, for many years, that it is pointless debating with Wells. He is a proponent of German New Medicine; a germ theory denialist beyond reason. And he is vicious. Remember, this is the same Catherine Hughes who was just recently awarded with the 2016 Western Australian Young Australian of the Year. Disgusting fascist policy. And the people who support it are all child abusers. The fact is that nobody would ever subject themselves to the equivalent (weight adjusted) dose of what babies are expected to get. In a recent posting on your blog you discuss an individual named Tristan Wells and list 46 people who are said to have “liked” one of Mr. Wells’ postings. 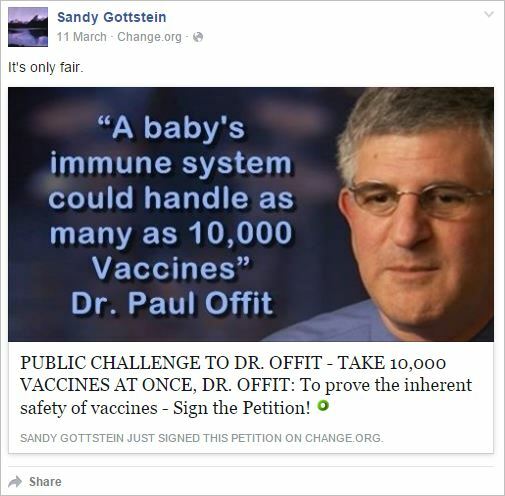 Included in that list is the name of my client, Sandy Gottstein. Ms. Gottstein did not “like” Mr. Wells’ posting and does not agree with it. If information you obtained indicates otherwise, it is incorrect. Because the statement on your blog suggesting that Ms. Gottstein agrees with Mr. Wells’ comments is incorrect and defamatory, we request that you remove her name from the list and your posting. I assume that her inclusion on the list was an inadvertent error, but with the information I am providing to you, your continuing to list her on your blog would be intentional, seriously defamatory, and actionable. If necessary, we would take such legal steps as are necessary to ensure that her name is removed and seek all available forms of legal remedy. I certainly hope that is not required. If you need any further information or have any questions about this request, please let me know. If not, please advise when Ms. Gottstein’s name has been removed from your blog. I won’t be removing Sandy’s name. She features in this screenshot taken of the list of likers. The list is a direct copypaste of the whole list of people who liked Wells’ call for the execution of health workers. So the blog entry is not “incorrect”. I will add her disclaimer and your email threatening defamation action to the blog post. This entry was posted in abuse, anti-vaccination dishonesty, australian vaccination network, AVN, meryl dorey, public health, skeptic, stop the australian vaccination network, vaccination, violence and tagged @Natholisticmum, abuse, Alexandria DaCosta-Furtado, Alice Martin, Allana Duncan, Amanda Barton, Amy Chanson, Amy Leigh, Angel Michelson, Anne-Marie Bradley, Annette Sicari, anti vaccination, australian vaccination network, Australian Vaccination Skeptics Network, Australian Vaccination Skeptics Network - HCCC Public Health Warning, AVN, AVsN, Bonita Kann, Bryce Holywell, Conscious Life Mama, Danae Schmidt, Danielle Thompson, Deni-Sue Huxtable, Donz Harris, Ebony James, Elizabethe Foster, Emily Waits, Fiona Elizabeth, Gordana Carich, Greg Beattie, Hayley Knersch, Helen Czapski, Jessica Vidacic, Kara Colclough, Kathy Matthew, Kylie E Flynn, Leanne Ayles-Hart, Lindsey Oele, Lorraine Silva, Loz Jessica, Melissa Lea, meryl dorey, Natural Holistic Mum, Niki Colmer, Rebekah Gooch, Renata Bialkowska, Rima Helal, Rixta Francis, Rochelle Brooks, Sal Shaar, Sandy Gottstein, Seri Carin, Shagun Batish, Shayla Moen, Stacey Dawson, Stacey Pollack, Tracy Jagger, Trevor Simons, Tristan Wells, vilification. Bookmark the permalink. I hope those ppl listed who commended the suggestion to kill health care workers understand that their families would no longer have access to effective medical care. As I recall, there are uninhabited islands near Australia. Send the lot of homicidal maniacs to one of those islands and re-introduce smallpox, whilst enforcing a naval quarantine of that island. Let them test their defective hypothesis and via their extermination, prove science is real. Of course, Tristan always fails to mention I’ve accepted his weight adjusted vaccine challenge multiple times. On the proviso that all costs for the vaccines are borne by him and in exchange he volunteers in an infectious diseases hospital in the third world for a few months. He still is to get back to me with a time he’s able to help out in one of these hospitals. Wouldn’t be because he’s waiting for Ebola transmission to settle, because nobody ever spreads diseases to anyone. You, me and the tea lady have all accepted his challenge. I asked him to forward to me a written detailed protocol for e “challenge”, including things like sourcing the vaccines etc. Those of us who’ve spent time reading his various ramblings on the web know Tristan to be a seriously disturbed individual – how he really became that way we can only guess. He also has all the traits common in psychopaths including an extremely narcissistic personality. It’s just fortunate he hasn’t acted on his violent psychopathic fantasies yet. It’ll be a sad day if he ever does. In all fairness only a very small percentage of psychopaths are violent. At what point does the AV(S)N get shut down as a violent extremist organisation? You liked it. The list is a direct copypaste from the list of people who liked it. The username of the account which liked it is yours. Your profile appears in the screenshot of the sample of people who liked it. Your protestations, along with your lawyer’s email threatening me with defamation, will be added to the post when I get home from my illuminati chapter meeting. Wow. As I said, I don’t know how it happened and I don’t agree with it. I don’t know why you are making such a noise about this. It’s not like you don’t wish harm on people already. This is you, right? I unliked it as soon as I figured out where it was. Did so many hours ago. Sandy, thank you for finally admitting that you liked Wells’ comment. Thank you for threatening me with defamation via your lawyer. You can apologise at any time. I’ll be the one in the corner turning blue. Also, did you know you blocked me on Twitter? Isn’t it strange that you blocked me, yet, here you are. Wells was odd even by antivax standards. His explanation for Pasteur’s sheep experiments was confusing, basically relabeling anthrax as transmissible trauma. He’s spent to long in his mommy’s basement. Karl Weathers, the town’s best – well – only lawyer has been summoned from his drinking hole to the police station to defend one incredibly accident prone erstwhile butcher. After visiting his client, we find him ranting to the folk in the police station. “But now I must bid you all ado, admonish you to watch your proverbial butts. For I shall be back with the sledgehammer of justice, prepared to lay Joseph waste to these four walls… [leaving the police station]… if you so much as touch a hair on my client’s… [sounds of shotguns cocking, which surprisingly, are aimed at his head]. “Hold on now we’re allies. Like Ho Chi Min and the Red Chinese”. The problem with the weight adjusted nonsense is that many common medications require children to get higher doses per kg of weight than adults. Anesthesia is one. If you used the same weight adjusted dose on an adult as you did a child the adult would die. Mr. Wells in his germ theory denialist guise is the gift that keeps on giving. This on the other hand is simply horrid. RCHM deleted it every time he posted it (three times), and when I DMed them they insinuated that this entry was defamatory of Wells. Just now I told them that it wasn’t and that it was all about Well’s own words as well as calling on them (again) to get him off the page. He needs to be institutionalized for life. Is there an Australian law where a person can be declared a danger to others in order to be involuntarily committed? Also, hope his wife leaves him. Heard he abuses women online.